The first Polish fraternities were founded in the nineteenth century at the German-speaking universities and other high-schools in all three states taking part in the partition of Poland. The oldest ones appeared in Prussia, then in Russia and finally, as of the second half of the nineteenth century, also on the territory of Austria-Hungary (vide About Fraternities). During the period of the Partitions of Poland there were 40 Polish organizations of fraternity and quasi-fraternity nature in total. Their history is still not well researched. In most of the cases they failed to develop a regular organizational structure. As few as 11 of them managed to keep their activities going till 1918, the year when Poland regained independence (Konwent Polonia, Arkonia, Welecja, Lutycya, Lechicja, Venedya, Ceres, Sarmatia, Jagiellonia, Lechia and Wisła). The oldest Polish fraternities were set up on the territory of Prussia. The first one - Polonia fraternity was set up in Wroclaw in the year 1816. The second one, bearing the same name, was founded in Berlin two years later. Although their internal organization resembled the German fraternities, the Polish fraternities were very patriotic and their customs were adopted to Polish traditions. Both aforementioned organizations were active for several years only, and they fell victim to repressions of the Prussian authorities in 1831 due to the November uprising. Photo and visiting card of Łucjan Klein (K! Lechia)Concordia was set up in Wrocław to continue its activities as Pogoń. During the First World War Neofrankonia was active in Wrocław. 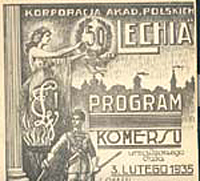 After the year 1918, their members Marian Schroeder and Łucjan Klein were setting up the first Polish fraternities in Poznań and Cracow. 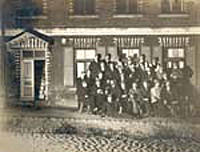 Finally, in 1913 the Gdańsk Academic Association Wisła was set up. This association became a fraternity after the First World War. 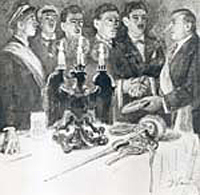 Venedya fraternity commercium, Dorpat 1991A decade later than in Prussia, the first Polish fraternities started its activity also on the territory of Russia. The first ones were set up in the territory of the Principality of Inflanty (today this area belongs to Estonia and Latvia), where many Poles studied in the XIXth century at the University of Dorpat (nowadays Tartu) and at the Technical University of Riga. A list of fraternities includes: Polonia (Dorpat, 1828), Arkonia (Riga, 1879. ), Welecja (Riga, 1883. ), Lutycya (Dorpat, 1884), Venedya (Dorpat, 1884), Lechicja (Dorpat, 1897). As in case of the Polish fraternities from Wrocław and Berlin, those organizations adopted the activity methods from German fraternities in Dorpat and Riga and polonized them in the course of time to adopt to their own needs. These fraternities were patriotic organizations. A significant amount of Poles studying there were involved in fraternity activities. These are the fraternities from Dorpat and Riga that turned out to be the most long-lasting university organizations set up during partition period. They all moved to Poland during and just after the First World War. Though not being the first Polish fraternities, they are said to be real founders of the Polish fraternity movement. As early as in the second half of the nineteenth century the Polish student associations appeared on the territory of Russia. They tended to set up fraternity-like organizations. In eighties of the nineteenth century Ogół was active in Moscow and in 1908 Sarmatia was founded in Sankt-Petersburg. Reception ceremony – Jagiellonia fraternity, Vienna around 1910.The activity of Polish fraternities and quasi-fraternities was far less developed in the Austro-Hungarian Empire. 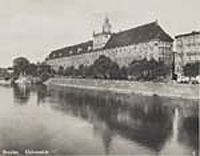 Związek Burszów Polskich active in Cracow around 1820 and Bractwo Filaretów as well as Jagiellonia (activity in eighties of the nineteenth century) should be mentioned here. In seventies Lechia ran its activities at the Technical University of Vienna. However, among significant organizations there were Jagiellonia founded in Vienna in 1910 and Lechia founded in Czerniowce.